As bland an unimaginative as any major brand. The bags are flavour colour coded. There is a cartoon like circle around the giant branding that features, presumably, a line drawing of a factory. The little Tayto man is also in the corner; presented like a 1980s game show host. There are also a couple of Crisps. To crunch these Crisps was almost like munching through a bygone age. The prevalence and advanced crunch of the modern Handcooked Crisp make these somewhat poor relations in comparison. You can literally turn the Crisp to mush through crunching with your tongue, such is their thinness. The texture of these Crisps was fairly basic. There were few oil boils, not much colouring, and virtually no skin on edges. Oh, and no seasoning visible. A Nose Plunge Test revealed a remarkably genuine aroma of both Cheese and Onion. We have not come across such a reliable representation of the smell. 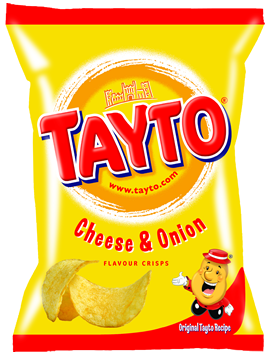 It is at this juncture that we should remind readers that these Crisps are not just the World’s first Cheese & Onion Crisp, but the world’s first flavoured Crisp. It would therefore be pretty difficult to claim that the first flavour is not the best example of the flavour, and the most reliable barometer for all subsequent flavours. We however, will claim that these are not the best example of Cheese & Onion Crisps that we have ever tasted. Although the combination works very well and is balanced beautifully, they were also just ever so slightly salty.